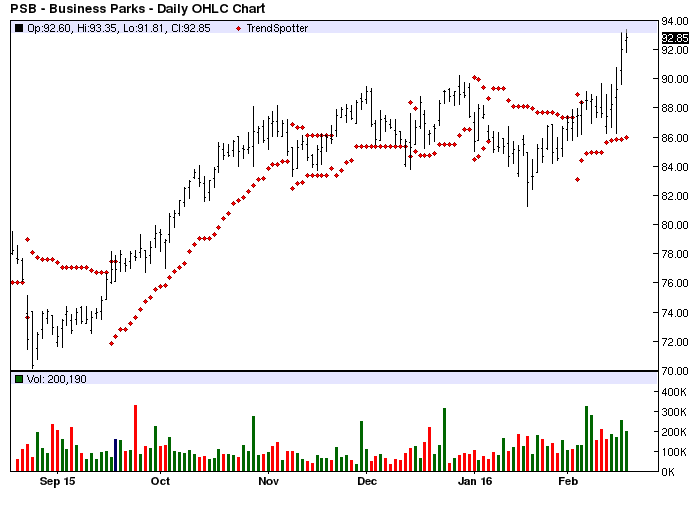 The Chart of the Day belongs to PS Business Parks (PSB). I found the REIT by using Barchart to sort the All Time High list first for the highest technical support level then I used the Flipchart feature to review the charts. Since the Trend Spotter signaled a buy on 2/3 the stock gained 6.11%. PS Business Parks is a self-advised and self-managed equity real estate investment trust specializing in the ownership, management and acquisition of business parks containing office flex space. The company has interests in a number of commercial properties located in the United States, primarily California, Texas, Oregon and Virginia.